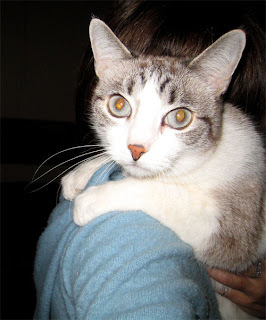 This cat, Hannah, was one of my Furry Godmother kitty-clients. I love her so much, and would adopt her myself if I didn't already have 3 cats and a new dog. Her person-mom is looking for a new home for Hannah due to a hectic travel and work schedule. She feels guilty for not having enough time to spend with Hannah. Email, comment or call me if you're interested in Hannah. I will then pass your contact info on to Hannah's current person-mom. and even get under the covers next to you. She'd probably be very happy in a easy-going, lively household where people/kids wanted to play with her a lot, like letting her chase a laser pointer, or playing with a string. She also loves watching/stalking birds or squirrels at feeders and playing in cardboard boxes. She'll be 13 soon, she was born around April 1995, and as you can tell from the photos,(taken this year) she still looks like a kitten. She has always been an indoor cat but still has her claws. Who Is That Middle-Aged Lady? Flying High with Sean Penn / Karen's Wedding!